I recently started taking two courses on Coursera, spending time on them late at night and on weekends. One course is on Startup Engineering (i.e., basic web programming) and the other is on Competitive Strategy (i.e., game theory for business). After a couple of weeks, I have to say that what the team at Coursera has built is pretty awesome. If you’re unfamiliar with Coursera, the concept is pretty simple. It’s an online platform that provides free classes from university instructors. The structure of the classes is similar to a class in the real world. There’s a course syllabus, weekly video lectures, weekly quizzes, supplemental reading material, etc. There are also online forums where you can post questions and interact with other students and the instructors. The quality of the instructors that Coursera has assembled is impressive and is the first aspect that stands out. These are top academics from top universities in the US and abroad – Stanford, Duke, Columbia, Michigan, Berkeley, etc. Each has invested significant time and effort in building the course material, recording videos, and all the other work that the product requires. Every course is free as well, which is leading to massive adoption from people around the world. The Startup Engineering course had over 100k signups at the time it started. I expect Coursera to keep the service free as that really removes one of the main barriers to adoption. There are all sorts of ways they can make money eventually – premium features, employers paying for student placement, etc. I also like the fact that the course catalog spans the full breadth of disciplines – humanities, social sciences, engineering, law, business, the arts, etc. rather than focusing more narrowly on say more vocation or “hard skills” (e.g., computer science). In that sense, Coursera’s offering really does mimic a world-class university. 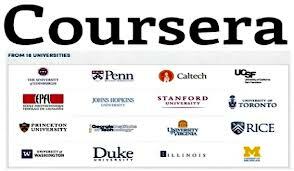 A frequent debate I’ve seen is whether online education efforts like Coursera can replace the university. One of the frequent criticisms of the online model is the high “virtual dropout” rate. I think these types of criticism and the very question of “replacing the traditional college model” miss the point. Coursera isn’t about necessarily about providing an alternative to traditional higher education. For someone like me, the choice is between Coursera and nothing. I wouldn’t be taking a class in game theory or startup engineering if there wasn’t the Coursera option. Maybe I’d buy a book and try to self-teach, or more likely I probably wouldn’t do anything. My guess is most people are in this category. The beauty of Coursera is that it allows you to get as much or as little out of a given course as you want. If you want to spend hours every week watching every lecture, taking every quizz, reading all of the supplemental material, etc. then that is your choice. If you want to take a “light” approach and be more casual about the work, you can do that as well. Coursera doesn’t need to replace anything to be an awesome education tool. Great piece and totally agree with the ‘Coursera is what you make of it’ idea. Personally, I haven’t found the time to focus on a specific course yet, but I know that I will be visiting again soon. And in terms of a free educational tool, it’s invaluable.